We go nuts for this place. A couple times a year we make the trip, maybe for a day of wandering with an out-of-town guest, or hitting the beaches with the dog. Maybe for a couple days, a romantic seaside dinner and a night at the Commodore Hotel. Maybe for even longer than that, like the solo writing retreat I did at an Airbnb there a couple years ago. There are many individual attractions in Astoria—breweries, museums, shopping, etc—but this is a love letter to the city as a whole. Founded as Fort Astoria in 1811, Astoria holds the distinction of being the first permanent U.S. settlement on the Pacific Coast. 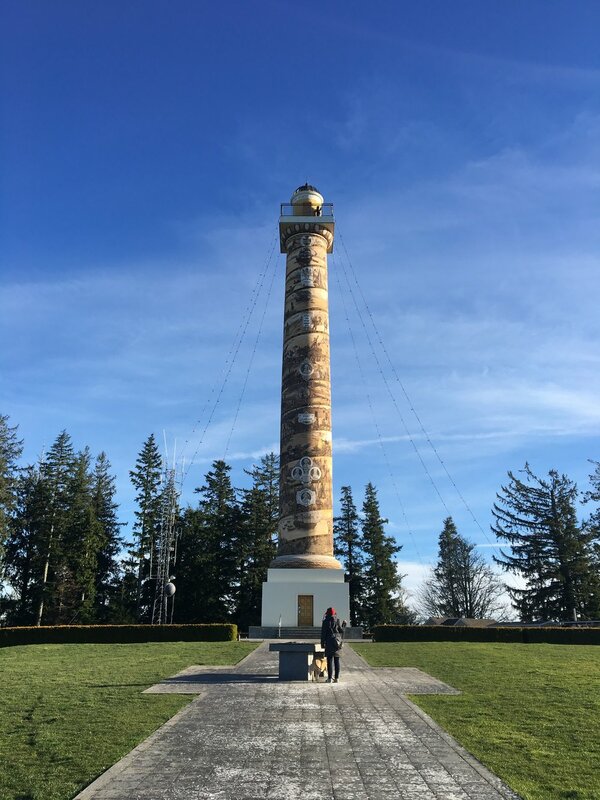 If you go to the Astoria Column, which is a great place to get oriented after arriving, you’ll see the city’s history illustrated on it, spiraling up the structure in sepia tones. There’s a winding staircase inside if you’d like to climb to the top, but from the ground, atop the hill, there’s already a very good panoramic view. To the South, you’ll see the Coastal Range, including the distinctive Saddle Mountain. To the North, you’ll see the mighty Columbia River. And, of course, the Pacific Ocean is West. Just give it a try: the Bowpicker. The town itself is mainly built into the hillside, with homes planted on the slope and businesses close to the water. There’s a compactness that lends Astoria a lot of charm. The city’s architecture helps as well. You’ll notice a lot of well-preserved Victorian houses, including the famous George Flavel House, which you can tour and learn about its dramatic history. There’s also the striking John Jacob Astor Hotel, built in the 1920s in Gothic Revival style. It’s a city of layers, assembled by generations who have lived there. The main streets downtown feature relics of mid-century businesses alongside modern boutiques. Even the stray late 20th century strip mall, complete with video store, finds some harmony. It’s nice to spend time walking the boardwalk along the river. Or, if you’d prefer, there’s a 3-mile heritage trolley. Several restaurants let you take in the view with a pint of beer and bowl of clam chowder. Meanwhile, you may be serenaded by dozens of barking sea lions who gather in the marina. Walk far enough west, and you’ll reach the foot of the impressive Astoria-Megler bridge, which ferries motor vehicles to and from Washington state and which ornaments the city of Astoria like a frilled green ribbon. This isn’t just an ordinary attractive coastal town. Astoria is defined by the confluence of the Columbia River and the Pacific Ocean, known as the Columbia Bar. Huge standing waves can cause major hazards for ships, and about sixteen seriously well trained and handsomely paid bar pilots routinely guide them in, often boarding the ships by helicopter. You can view this process from nearby Fort Stevens State Park or Cape Disappointment, and you can learn more at the Astoria Maritime Museum. One building: beer and pastry! There’s a lot ambiance to experience in Astoria. Really, just go and check it out. And though I said this is about the city as a whole, not specifics, I’ll give you a couple pointers: Have lunch at The Bowpicker, a dry-docked boat that dishes up transcendent fried halibut and chips to long lines of customers. Grab a pick-me-up coffee at the excellent Street 14 Cafe, attached to the Commodore Hotel. Godfather Books is a delight. And Fort George Brewery has a beer selection that won’t let you down. You could take the trolley, or just walk.